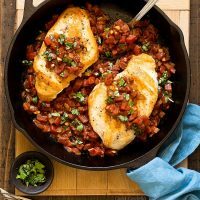 No more guessing what’s for dinner when you can make Balsamic Tomato Skillet Chicken with ingredients in your pantry right now! Dinner for two is ready in under an hour. It seems more and more lately I’ve been making less and less time for dinner. Sometimes when I meal plan, I don’t know what to make and think “oh I’ll figure it out later.” Then later comes and I still haven’t figured it out. Then I end up cobbling together a not so healthy dinner. Rinse and repeat the next day. Does that sound familiar? I bet you can relate too. We need to get back on track! One way to do this is have a list of favorite meals. Ones you can make every week and never get tired. 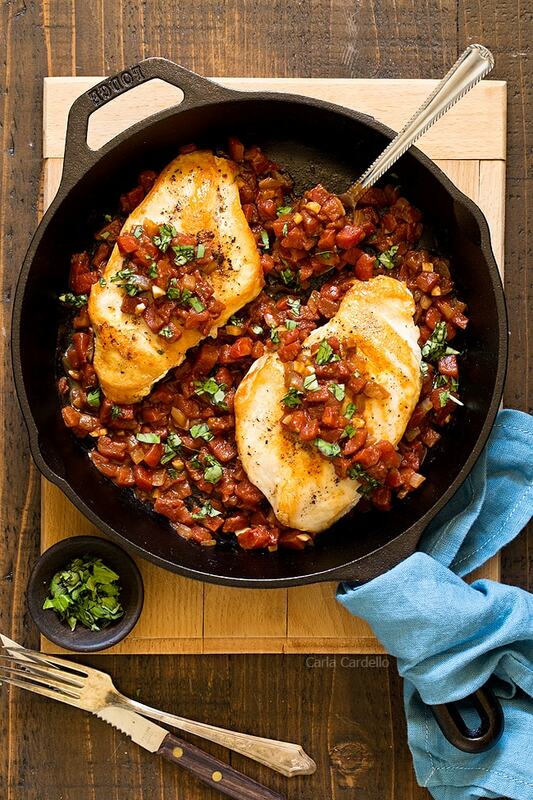 I’ve been making Balsamic Tomato Skillet Chicken for a few years now. 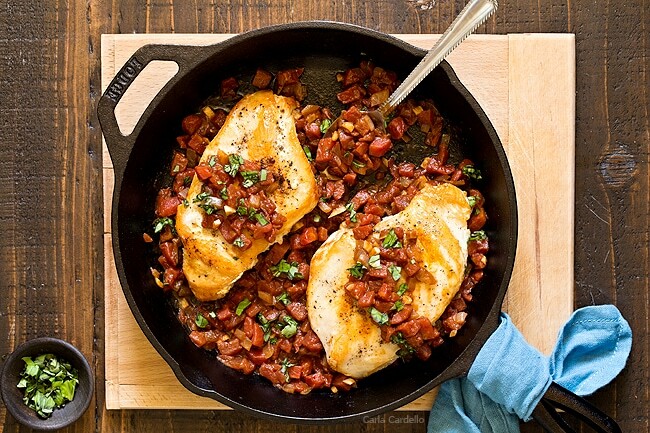 They’re chicken breast sautéed on the stove with a “sauce” of balsamic tomatoes. Balsamic vinegar is one of my favorite flavors, which is why I can eat this dinner again and again. Plus between browning on the outside and not overcooking it, the chicken stays moist and flavorful. 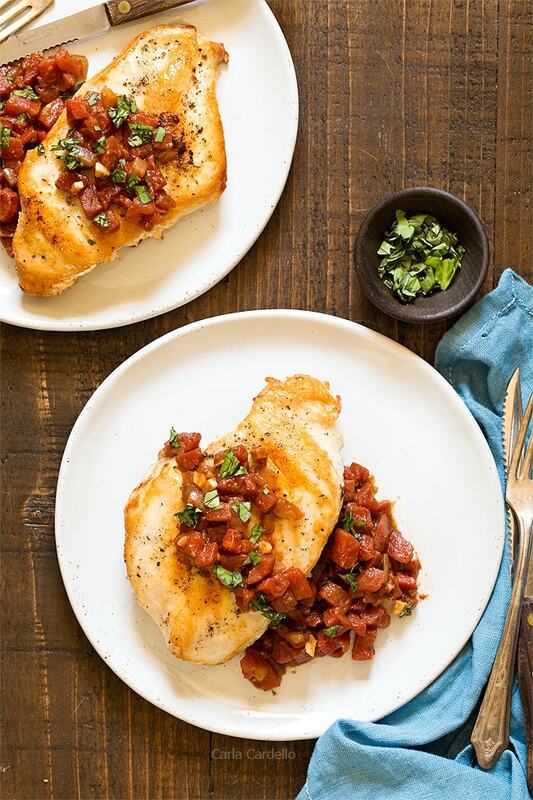 Chicken breast cooks relatively quickly, which makes them ideal for skillet chicken. The thinner they are, the faster your dinner will cook. Plus if they’re too thick, there’s a good chance the outside will burn before the inside cooks fully. Pound the breasts to about 1/2 inch thick with a meat mallet (or rolling pin or can of green beans or…). I did try using chicken thighs, but they took way too long due to the bone. 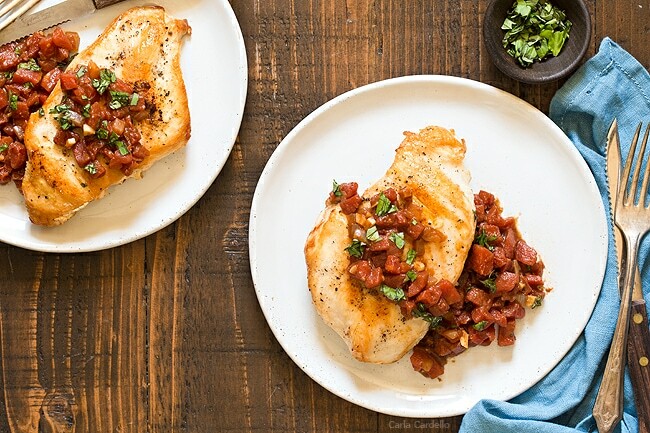 Sometimes you can buy boneless thighs, but that’s about hit or miss. Of course you can debone them yourself, but I know most people won’t. My favorite part of this dish is the balsamic tomatoes. It acts like a sauce for the chicken, although it’s more of a side of cooked tomatoes than an actual tomato sauce. I love using canned tomatoes in my cooking, especially when fresh isn’t available. The brand I used in my recipe is Redpack. Or depending on where you live, Red Gold. They’re actually both from the same family-owned company. Same high-quality tomatoes grown on the same family farms. Just different labels. And if you live in PA like I do, you may notice the labels switching over from Redpack to Red Gold. Don’t worry though; no matter which label you see in stores, the taste is the same. For more information about Redpack, visit their website, Facebook, and Instagram. If necessary, pound chicken breast to 1/2 inch thick. Lightly sprinkle with salt and pepper. In a large skillet, heat the oil. Once hot, add the chicken top side down. Cook 5 minutes or until golden brown. Flip and cook until golden brown and internal temperature reaches 165F degrees, about 10 minutes. Transfer to a plate and cover loosely with foil. If skillet is dry, add a little more oil. Add the onion and a big pinch of salt. Cook until softened, about 5 minutes. Add garlic and cook 1 minute. Add the tomatoes, broth, and vinegar. Bring to a simmer. Simmer for 5 minutes or until the mixture thickens and the liquid has mostly evaporated. Taste and add up to 1/2 teaspoon salt. Remove from the heat and stir in the butter until melted. Add the basil and any clear juices accumulated from the chicken. Taste and adjust for salt. Add the chicken and serve immediately. Disclosure: This post is sponsored by Redpack Tomatoes. Thank you for supporting me and the companies I work with as sponsored posts help pay for the costs of running my site, including website hosting and groceries for recipe development. I live in Ohio and i agree with you on Red Pack and Red Gold tomato products. Their flavor is excellent and I can definitely tell when I use them and when I don’t. 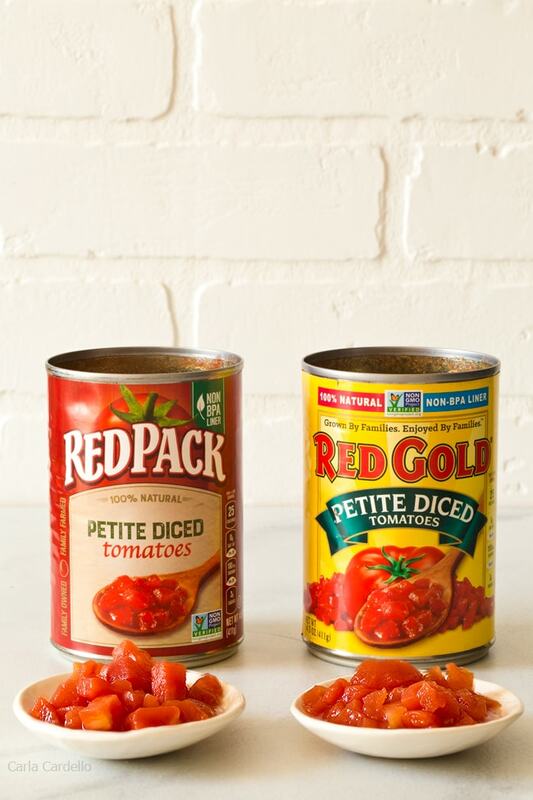 Yes there are certain brands that stand out when cooking, including Redpack/Red Gold. Where are you from in PA?